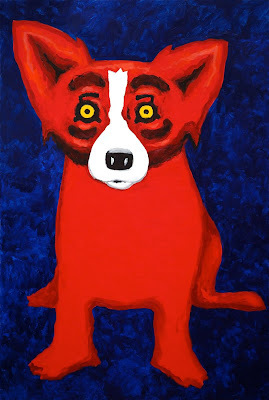 The Red Dog first appeared in 1990 about the time George Rodrigue started re-thinking the loup-garou, turning it into an entity beyond a Cajun legend, turning it slowly into something else. 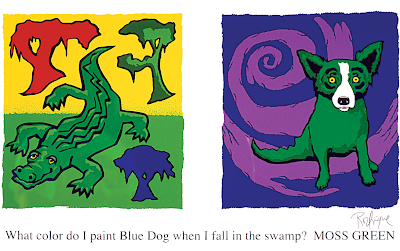 You may remember from the post Blue Dog: In the Beginning, 1984-1989 that George changed the red eyes of the early loup-garou paintings to a less ominous yellow as the image developed into the Blue Dog. 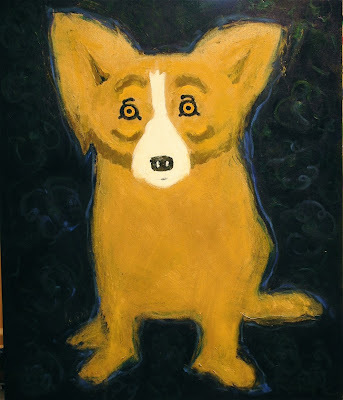 Yet a part of him missed the werewolf myth, and for several years the yellow-eyed dog appeared exclusively in cemeteries, featuring the same dark night sky that inspired the blue fur from the beginning. 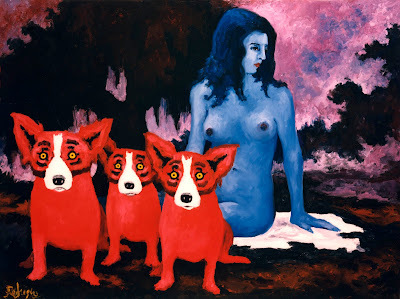 Occasionally he took this to an extreme with paintings such as Devil Dog (1990, oil on canvas). 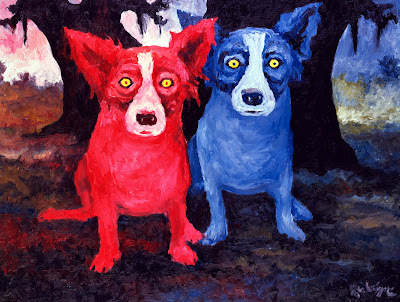 As a result, the darker roots remained alive on his canvas, and for sometime he experimented with illustrations of good (as symbolized by the Blue Dog) and evil (as symbolized by the Red Dog). 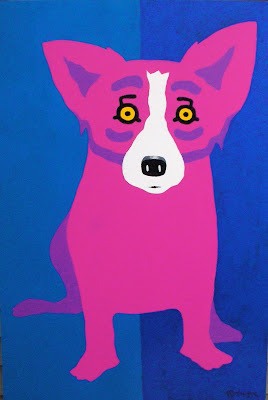 Usually he kept this pretty light, and I recall in the gallery explaining the Red Dog as “the devil in her,” or “Tiffany’s mischievous side.” (pictured, The Devil in Me, silkscreen from 1991, and The Blues Can Hide a Bad Apple, oil on canvas from 1992). 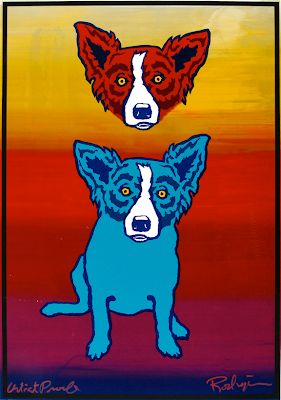 George, however, rarely spoke of the Blue Dog as ‘Tiffany’ (even though, ironically, he says she was a somewhat mean little dog), but rather described the image itself as having a “split personality” or an “alter ego.” (pictured, Split Personality; Mischief On My Mind, original silkscreens from 1991 and 1992). By the mid-1990s I remember explaining the Red Dog not as 'Tiffany's mischievous side,' but rather 'George's.' 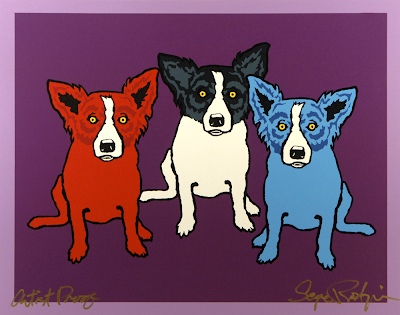 (Three Dog Night, 1993, 36x48, below)…. 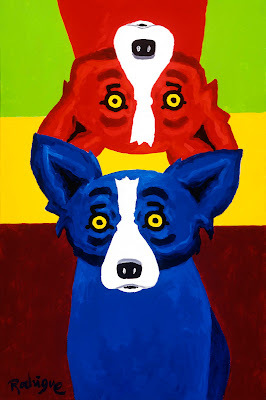 But above all else, as I’ve described repeatedly throughout these essays, George’s interest lies in creating something interesting to his eye ----something that does not have all of the answers, but rather poses questions about life, while at the same time leaving no doubt as to each composition’s deliberate design and George Rodrigue’s passion for and study of color. In art school his professors described him as a “colorist,” an ironic title when one considers his black oak trees from the 1970s. Yet he’s often told me that even a painting as monochromatic (and dark) as the Aioli Dinner required a palette full of color. 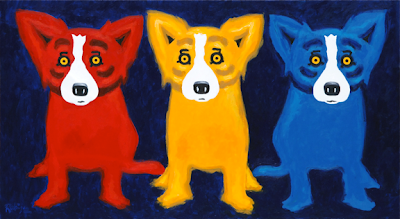 George’s change from oil paint to acrylics in the early 1990s made his love for primary colors more obvious, and over the years his canvases have grown brighter and brighter. 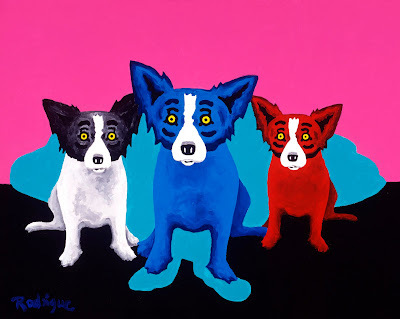 Today, twenty years after the first Red Dog painting, people approach George’s work with statements like “Oh, I see he’s painting Red Dogs now,” as though it’s some new twist on the Blue Dog paintings. 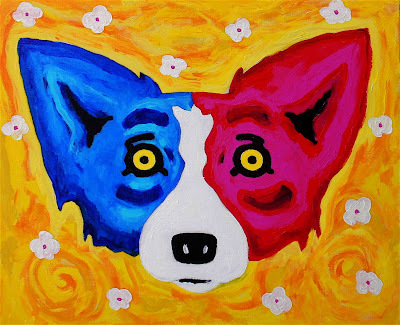 If you think of it this way, then suddenly the Red Dog, no longer the ‘alter ego’ or the ‘devil in him,’ seems as natural as ….well ….. Blue. 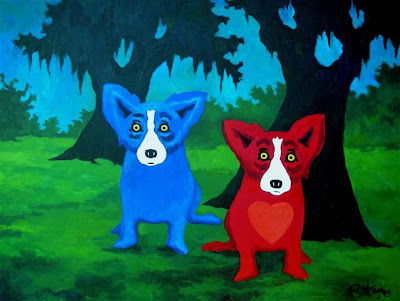 As detailed throughout these blog posts, George Rodrigue has only a few consistencies in his art: his attention to strong design, his understanding of color, his original ideas, and his change or growth as an artist. 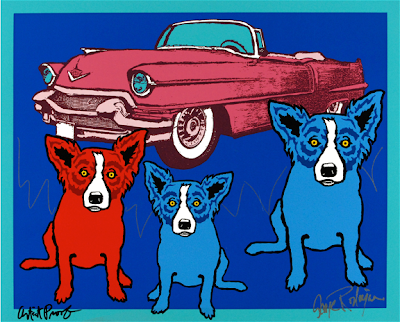 This is why the Blue Dog paintings, so often mis-interpreted as the same from canvas to canvas or year to year, require so many entries (although in some ways the paintings of later years come to look more like the original silkscreens of earlier years, but I'll touch on this more in a silkscreen post down the road). Within this “Red Dog essay,” however, the entire development plays out on one page. I hope it provides an obvious understanding of why it took George twenty years of change and growth to get from Devil Dog (size 20x24, 1990) pictured at the beginning of this entry to Color Me Young (size 42x78, 2010), pictured below.